So following on from my last post on statement earrings (click here) it's only natural that I follow up with some stunning statement necklaces & bracelets. After all a statement necklace & or bracelet can transform the plainest of outfits & who doesn't like a bit of affordable bling?!!! Now I know it's a bit late for inspiration for Christmas seeing as tomorrow is actually Christmas Day but of course there's still plenty of time for New Years Eve & with sales frenzy about to reach fever point who knows some of these beauties may actually be reduced in the next twenty four hours or so! First up is this absolutely stunning necklace from J Crew. And whilst it might be priced that bit higher than your average high street necklace the price could easily be justified *argued* by the fact that it's simply going to go with EVERYTHING in your wardrobe, so when worked out on a cost per wear basis, well it's as cheap as chips :-) & I think it would look especially stunning with a breton top, boyfriend jeans & blazer. 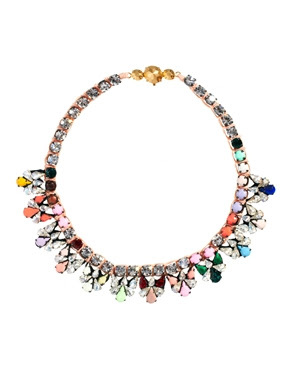 In a similar design & containing every colour under the rainbow is this lovely necklace from ASOS, -bling & a variety of colours....seriously what's not to love?!!! 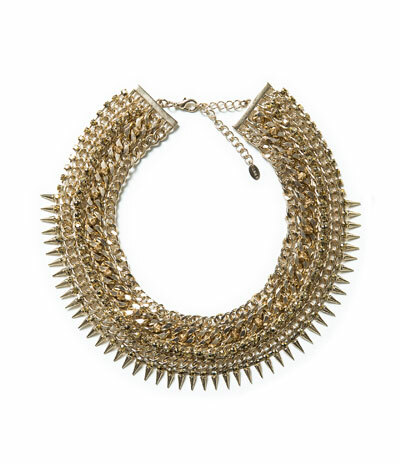 If however, you fancy turning the bling-o-meter up to max then how about this stunning necklace from Topshop. I'm totally loving the name 'Princess Collar' as much as the necklace & think it would rock with a denim shirt & some fab faux leather trousers or skirt. Of course as any true Zara addict worthy of the name I have a fair few necklaces from Zara which I have to say considering they have only been selling necklaces for the past 12-18 months is probably one of the main reasons my statement necklace obsession & collection has rapidly grown in the same period!! Zara do some amazing pieces for a reasonable price & this multi flower crystal necklace is no exception & would be a fab piece for bringing together a monochrome outfit. 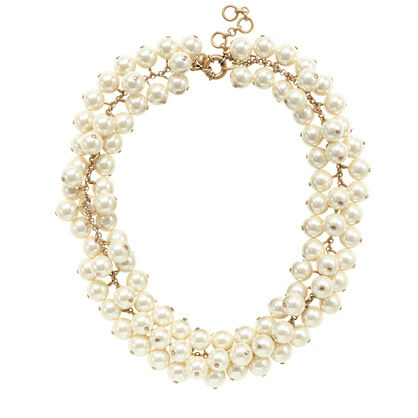 Next up is this lovely pearl cluster necklace from J Crew. 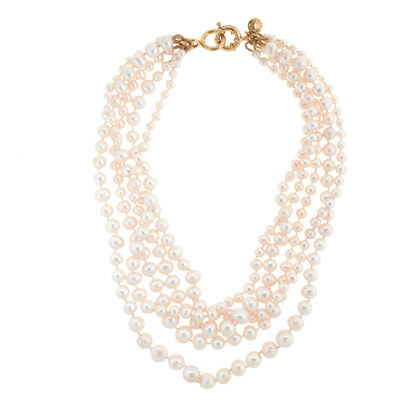 Of course now I've officially reached the big four-0 it doesn't mean I'll be wearing only pearls & a twinsets from now on but I have to admit to loving a fab set of pearls & this necklace is no exception. Teamed with a white shirt, skinny jeans & some ballet pumps it would just bring that extra bit of effortless glamour to your outfit & really is a necklace that's going to last you a lifetime. 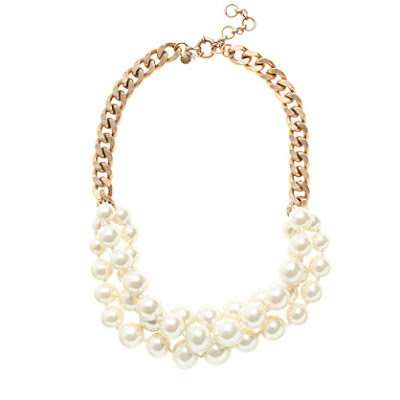 Sticking with pearls for this next necklace & I'm loving this twisted pearl necklace also from J Crew. It reminds me slightly of the Zara one I brought earlier in the year & have had SOOOO much wear from & would actually be lost without. For a more timeless & elegant feel then you would never go wrong with this twisted pearl necklace. Just effortless glamour whether teamed with a fabulous tailored shirt, a LBD or if worn over a crew neck jumper with distressed boyfriend jeans & courts. For something a bit more eye catching then this turquoise number from Banana Republic should do the trick. Again this would look amazing when teamed with denim but equally stunning when worn with black or navy too. 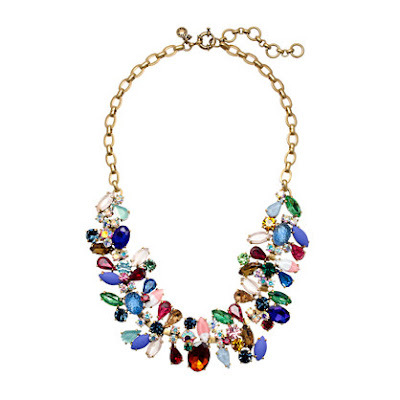 I'm also totally loving this blue & turquoise statement necklace also from Banana Republic, simply exquisite. For a necklace worthy of the name 'statement' then this next necklace has to be top of the list & also ticks the box for working the black and blue trend too. Next up something a little bit more elegant & simple is this gold and blue linked necklace from Banana Republic. Again a timeless, elegant piece that would look great when teamed with a white shirt, jeans & a navy blazer. Finally for a statement necklace that's simply going to go with everything in your wardrobe then how about this multi chain one from Zara? I'm loving the spiky detailing which will add that element of rock chick to any outfit. Moving right onto bracelets & this is another accessory I may own the odd one or two of! And if you like matching sets then it would be rude not to add this Banana Republic Poppy Link bracelet if ordering the necklace ;-) Of course the bracelet would look equally fab without the necklace & whether worn on it's own or teamed with a couple of extra gold bracelets it's going to look stunning whether dressed up or down. 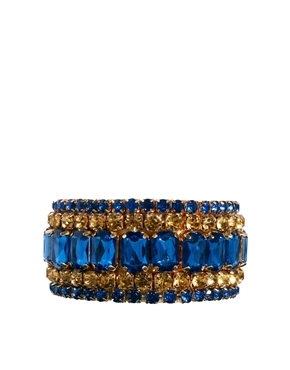 Now this next bracelet from Banana Republic certainly got my inner magpie all excited & I'd be lying if I said it wasn't because of the bling....TOTALLY, TOTALLY love it. Moving away from bling & onto leather & these gorgeous leather & chain cuffs. 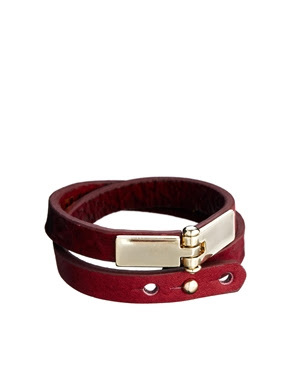 I'm not sure if it's something to do with my inner teenager refusing to let go but having worn various friendship bracelets in my youth I'm a TOTAL sucker for a leather cuff. And think these would look amazing teamed with a gold chain bracelet or two. 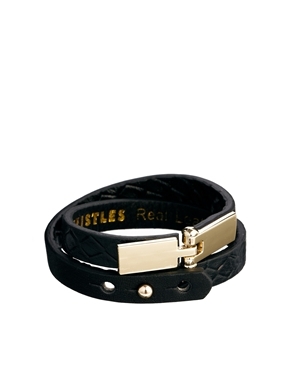 Sticking with leather bracelets you won't be surprised to hear that I'm also loving this Whistle double wrap bracelet. A great timeless investment that can so easily be dressed up or down. For a bracelet that is that little bit different to everything out there then what about this wide cord bracelet from John & Pearl? 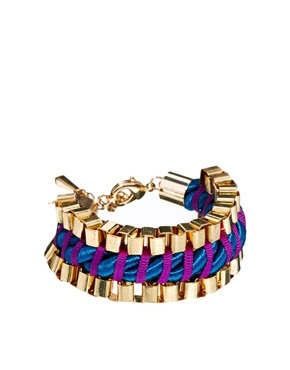 This has a real 'grown up' feel to the multi coloured corded friendship bracelets I used to wear a long time ago!! For a statement bracelet that can just be thrown on & doesn't need layering with other bracelets then this gorgeous one from Johnny Loves Rosie is stunning & will add a real bling factor to your outfit. Moving on to more of a bangle feel & this lovely Wallis animal clamp bracelet is something that little bit different. 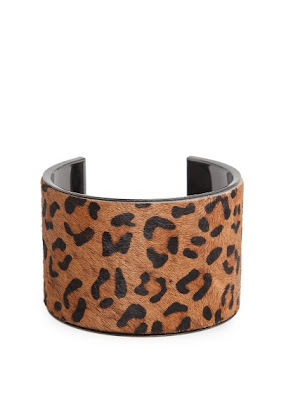 I have a similar styled one from Banana Republic in leopard print & I can't tell you the amount of wear it gets. This cluster bracelet from Dorothy Perkins is also stunning & would really rock up your faux leather leggings not to mention skirts. For any fellow 'Bet' lovers out there then if you're anything like me you're going to love this leopard print cuff. Dress up with faux leather or a LBD or dress down with some jeans and a white shirt. A brand I featured in my blog on cocktail rings also do some rather gorgeous multi wrap bracelets too....I could so easily buy all these colours. I also totally love this set of textured gold bracelets too, which would look amazing either worn on their own or teamed with some of the other gorgeous bracelets I've featured in this blog. Finally I LOVE this double bracelet with pendants also from Ashiana, I think this is one of those bracelet that wouldn't leave my wrist. So there you have my selection of the neck & wrist candy that has recently caught my eye & would love to be finding under the tree tomorrow morning. So before I love & leave you here's a quick round up of my outfits from the last few days, starting with my outfit I wore on Sunday for the last (yup still eking it out!!) of my birthday celebrations! So have you caught the statement necklace or bracelet bug yet? If so do you have a favourite go to piece or are you getting addicted & constantly adding to your collection? Perhaps you just don't see the appeal & would rather wear a simple chain? Or maybe you've got your eye on a special something you're hoping to treat yourself to with some Christmas money? I'd love as always to hear your comments & thoughts. Finally have a really wonderful happy & merry Christmas & remember there's nothing that can't be solved with plenty of bubbles ;-) See you after the turkey! !